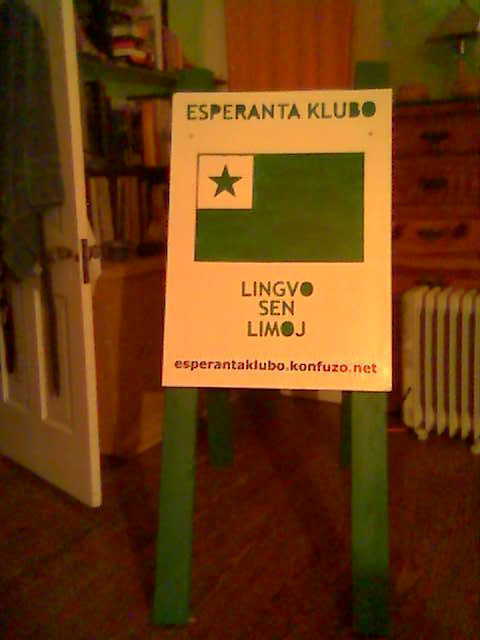 Welcome to the webpage for the Esperanto Club at The University of Texas at Austin. We are a group of students who are interested in learning, using, and promoting the language Esperanto mainly through weekly meetings where we talk in the language about whatever's important to us at the moment. Sometimes we make pictures and recordings of ourselves. Bonvenon al la retpaĝaro por la Esperanta Klubo ĉe La Universitato de Teksaso ĉe Aŭstino. Ni estas grupo de studentoj kiujn interesas lernado, uzado, kaj propagandado de Esperanto. Ni faras tiujn ĉefe per semajnaj kunvenoj dum kiuj ni parolas tialingve pri kiuj ajn gravaj al ni tiam. Foje ni kreas fotojn kaj sondosierojn de ni mem. 2007-09-14 - Unfortunately, our beautiful sign got destroyed over the summer by wind and rain. 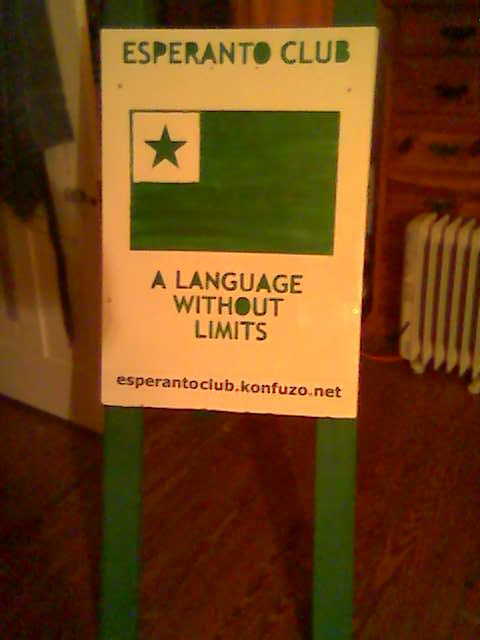 Even though it was good for us to have that sign out, and it helped get the word "Esperanto" in front of people, we think that the benefit isn't worth the work of building another sign. Ah, well. 2007-09-14 - Malbonŝance, nia bela reklamaĵego detruiĝis dum la somera per velo kaj pluvo. Kvankam bonis, ke homo vidis la reklamaĵego, kaj ĝi metis la vorton "Esperanto" antaŭ homoj, ni pensas, ke la rezulto ne valoras egale al la laboro de konstrui alian. Ve. 2007-02-15 - The third meeting of the Spring semester was small, Grejo, Vaelen, k nehundo, but good conversation. 2007-02-15 - La tria kunveno de la Printempa semestro etis, Grejo, Vaelen, k nehundo, sed estis bona konversacio. 2006-08-06 - 2 members of the club went to Sarajevo for the 62nd International Youth Conference. 2006-07-21 - We had a small meeting and talked about the "sin-" words. 2006-07-21 - Ni havis kunveneton, kaj parolis pri "sin-" vortoj. 2006-07-20 - Greg left for the UK (Florence) and the IJK (Sarajevo). 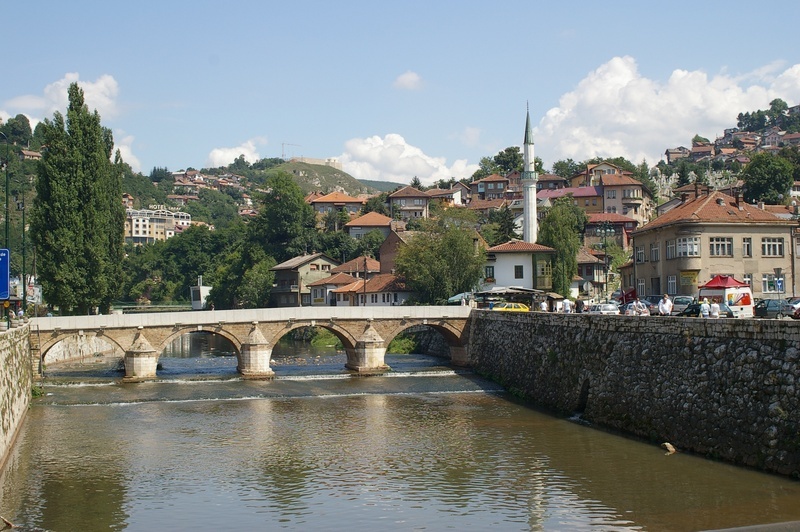 2006-07-20 - Greg foriris por la UK (Florenco) kaj la IJK (Sarajevo). 2006-07-14 - Club meeting: We played dominoes in Esperanto, and Anderson gave a short report on "por ke" and "ankoraŭ ne." 2006-07-14 - Klubkunveno: Ni ludis domenon Esperante, kaj Anderson raportis mallonge pri "por ke" kaj "ankoraŭ ne." 2006-07-05 - We just put the A-frame back up. 2006-07-05 - Ni ĵus restarigis La reklamaĵegon. 2006-05-22 - We had to take the A-frame down at the end of the semester. 2006-05-22 - Ni devis malstarigi La reklamaĵegon je la fino de la semestro. 2006-04-22 - The A-frame was put on campus. 2006-04-22 - La reklamaĵego metiĝis sur tereno. 2006-04-18 - Our friend Rob Read of the Esperanto Club of Austin asked us to help him advertise the 1st Internet Esperanto Poetry Slam which will happen during the 54th National Convention of ELNA in New York City July 21-24, 2006. 2006-04-18 - Nia amiko Rob Read de la Esperanta Klubo de Aŭstino petis, ke ni helpas lin pri reklamado de la 1-a Reta Esperanta Poezia Konkurso kiu okazos dum la 54-a Landa Kongreso de ELNA en Novjorko je julio 21-24, 2006. 2006-04-17 - After 13 manhours, we finally finished the A-frame sign. 2006-04-17 - Post 13 laborhoroj, ni finfine finis la A-framan reklamaĵegon. 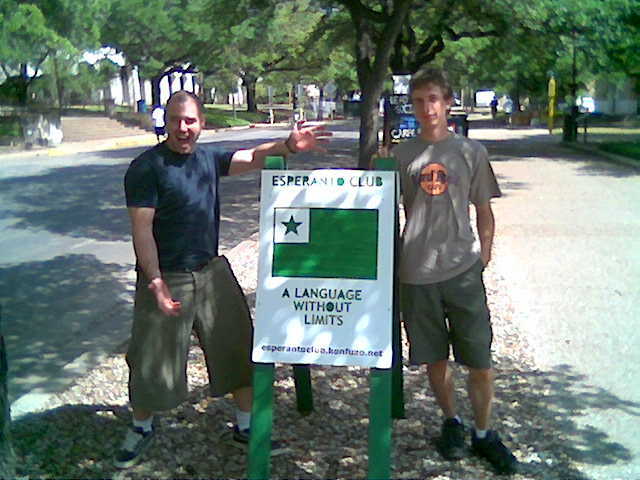 2005-11-25 - The Esperanto Club became an official club at UT. 2005-11-25 - La Esperanta Klubo iĝis oficiala klubo ĉe UT.